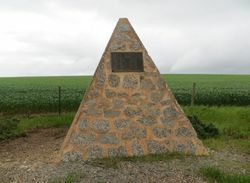 A cairn erected by the Geographic Society marks the place where his John Horrocks and his party camped at the intersection of Main North Road and Narridy Road. The cairn was unveiled in the centenary year of his death. The explorer, John Horrocks passed through the Gulnare area in 1841. Horrocks`s dog, Gulnare, caught seven emus in five days, thus saving the party from hunger. Horrocks named the Gulnare Plains after his canine companion. Unlike many, Horrocks would not wait in Adelaide for the completion of land surveys. On the advice of Edward John Eyre, he explored land near the Hutt River, north of Adelaide and established Penwortham village. Other pastoralists followed him into the area. In 1841 the long awaited special survey gained a frustrated Horrocks title to only some of the fertile land he had been occupying. Nevertheless, he built up a flock of 9000 sheep and is believed to have established the first vineyard in the Clare district. In 1846 he mounted an exploratory expedition into the far north of South Australia, aiming for distant hills near Lake Torrens, hoping to find good agricultural land. Among his party was artist Samuel Thomas Gill. Near Lake Dutton, still short of his objective, Horrocks was accidentally shot in a hunting accident, and so is unfortunately known more for his death than for anything else. His gun fired after the camel he was using lurched, knocking him and causing the weapon to discharge. His injuries were very substantial and included some teeth being knocked out by the bullet. 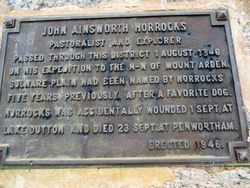 The expedition was abandoned and the party returned to Horrocks' home at Penwortham, where he died of gangrene a month later. The centenary of the opening of Horrocks Pass will be celebrated at Wilmington on Saturday and at Gulnare and Penwortham on Sunday. The members of the district councils of Wilmington and Germein have co-operated in making the celebration at Wilmington a memorable one. At 11 am. on Saturday, the president of the Royal Geographical Society (Mr. C. M. Hambidge) will unveil a memorial at the top of Horrocks Pass. The Chief Secretary (Mr. McEwin) and the Minister of Agriculture (Sir George Jenkins) will be present. A sports gathering will be held at Wilmington in the afternoon. On Sunday at 10.45 am. a cairn will be unveiled at the junction of main north road and the Port Pirie road, near Gulnare and at 3.30 pm there will be a similar ceremony at Penwortham to mark where Alexander James Horrocks died 100 years ago after finding the pass through the Flinders Ranges. The Advertiser (Adelaide), 19 September 1946. On His Expedition To The N-W of Mount Arden. Five Years Previously After A Favourite Dog. Lake Dutton And Died 23 Sept. At Penwortham.